Dunno why, but since I entered academia five years ago, the number of meetings that I attend has multiplied exponentially. Happily most of these meetings are with ridiculously photogenic and provocative personalities. So here’s a little Storyteller Uprising experiment. I’m going to take random photos of the people I meet with over the next while and post them here. 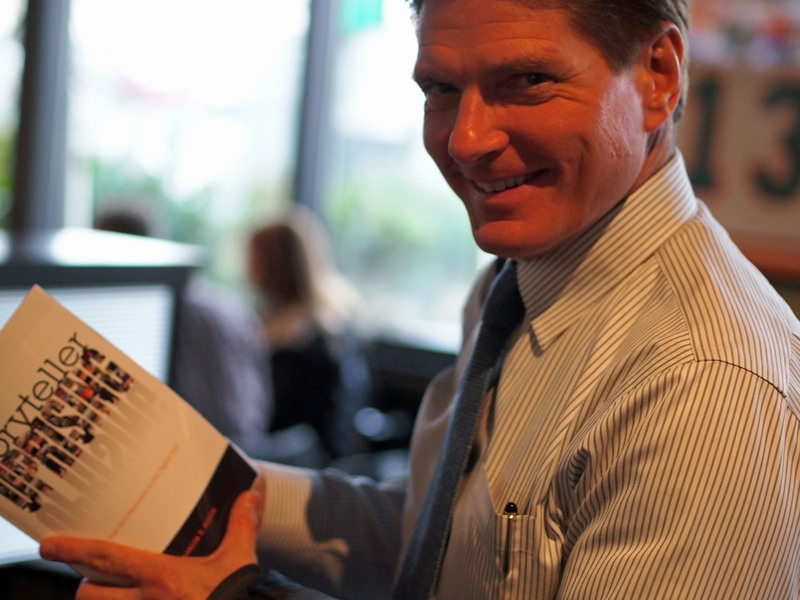 Here’s fellow NBC refugee Brad Goode, early adopter of the book (he submitted the first Amazon review). Brad was thinking about getting out of local TV news for good when he left KING 5 in Seattle last year. But similar to Al Pacino, just when he thought he was out, they pull him back in.. Now he has a plum morning gig at the ABC affiliate, KOMO. At lunch we discussed what convinced him to return to the machine, and how we might collaborate with some on-air tech segments (think Laurel and Hardy). Oh and we both had the buttermilk fried chicken sandwich at Sport Restaurant and Bar.